Review: The Lady is a Vamp | Oh, The Glamourous Life! Just a few more books remain on the shelf and several of them are memoirs or biographies. 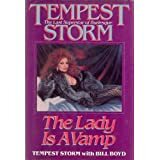 The Lady is a Vamp by Tempest Storm (The Last Superstar of Burlesque) with Bill Boyd (1987). Tempest Storm is one of the true living legends of burlesque. She still performs, still has a fantastic figure and a mane of flaming red hair, and still dazzles. I’ve had the honor of appearing in her “Las Vegas Burlesque Revue” and can say first hand that she’s a gracious lady. But all was not glamour when she was a little girl. Born Annie Blanche Banks to a sharecropping family in Georgia, she knew only hard work. As a teenager she learned quickly that her large bust only lead to heartbreak and abuse. At 14 she was supporting herself as a waitress and dreaming of fame in Hollywood, despite her crooked teeth. When she finally did get to California and became a burlesque dancer, fame and fortune did quickly follow. Storm quickly moved from chorus girl to stripper. After being falsely accused by Lili St. Cyr of sabotaging the star’s act (someone else discarded straight pins on the stage and Miss St. Cyr stepped on them in her bare feet), the newly (and appropriately) named Tempest Storm fought back and was quickly shipped off to another theatre, but as the headliner. And she’s been a headliner ever since. There’s not a great deal on career other than how successful she was and what fabulous gowns she wears. She does talk very briefly about developing her signature act, but that’s about it. Much of the book is about her relationships. She was involved with a lot of men who were abusive, jealous, and possessive, including some of her husbands. She’s not shy about detailing their cruelties. On the other hand, she spends a lot of time recalling the various celebrities she bedded, from Elvis and JFK to Nat King Cole and Mickey Rooney. She treats these lovers with affection and occasional wistfulness. Bettie Page fans will be disappointed that Miss Storm doesn’t even mention her appearance in Irving Klaw’s film Teaserama, let alone dish about it.